Fleece jackets - warm, soft, and quick-drying! Fleece is the perfect material for outdoor clothing! It will keep you toasty and warm, and is super easy to care for. Most fleece materials are made from polyester fibers and are machine-washable. The fabric won't lose shape and will still look great after plenty of washes. Another point in its favor: Fleece material dries super fast! This is a huge advantage touring for several days, as the fleece can be dried overnight and is ready to use the next morning. And fleece is also lighter in weight than wool, for example. It is slightly water-repellent and doesn't soak up moisture as cotton would. Fleece will still keep you nice and warm even when damp. The low packing volume makes fleece jackets the perfect choice for day tours or traveling. They will need almost no space in your backpack, but will come in very handy for chilly nights. The soft material won't scratch or be itchy on the skin, which makes it a real favorite among kids as well. In terms of outdoor use, fleece jackets are perfect for heat insulation. More often than not, fleece jackets will be worn as one of several layers of functional jackets. Simply wear a waterproof hardshell jacket over the fleece to keep you warm and protected wherever you go. There are many different types of fleece, which can differ greatly in terms of quality. There are, for example, fleece jackets with varying material density, which all have their particular purposes. The information 100x or 200x fleece describes the weight of the material per square meter. A 100x fleece is therefore a lot thinner than a 200x fleece, and will weigh a lot less. This might be very useful if you have to pack light. It always makes sense to take along some type of fleece jacket, even if you don't expect the weather to become very cold. Summer jackets made of fleece are also great for those evenings spent in your cabin. A good and heavy fleece material comes in handy in winter and at very cold temperatures at high altitudes. Of course you could also wear several fleece jackets in layers. There are fleece coats for the transitional period that are specially made for women, which are particularly suited for everyday use as well as sports activities. Fleece jackets are differentiated by their material quality. Low quality fleece is easily recognized, as it will form unsightly surface nodules and show signs of wear after a few washes. A really good fleece jacket made by professional manufacturers like Vaude, Salewa or Norröna will still feel soft after a lot of wear and won't scratch. Another criterion for judging a fleece jacket's quality is its breathability. Good quality fleece material will keep body heat insulated, but will also ensure sufficient ventilation. What fleece jacket for what purpose? Today there are many different types of fleece materials with entirely different properties and different uses. There is the super light-weight microfleece at one end of the spectrum, and the almost entirely windproof heavy fleece at the other. Very specific material mixes are used for various purposes, which will perfectly match the climate in which it is to be used, as well as individual requirements of the wearer. 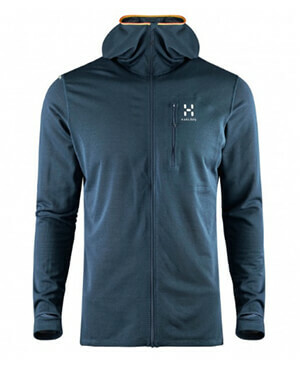 Most mountaineers, skiers and hikers have fleece jackets in different thicknesses and designs. That way, they can always wear the right layers for the current weather and temperature. The fleece that is worn in the fall as a transitional jacket can therefore be worn as a mid-layer in the winter. Depending on your needs, you can combine these with fleece hats and fleece gloves to make up complete fleece outfits for men, women and children.